Jennifer Lynn Kelly is an Assistant Professor of Feminist Studies and Critical Race and Ethnic Studies at University of California, Santa Cruz. She received her Ph.D. in American Studies with a Portfolio in Women’s and Gender Studies from University of Texas at Austin, her master’s degree in Interdisciplinary Humanities from New York University, and her bachelor's degree in Feminist Studies and Literature from University of California, Santa Cruz. Her research broadly engages questions of settler colonialism, U.S. empire, and the fraught politics of both tourism and solidarity. 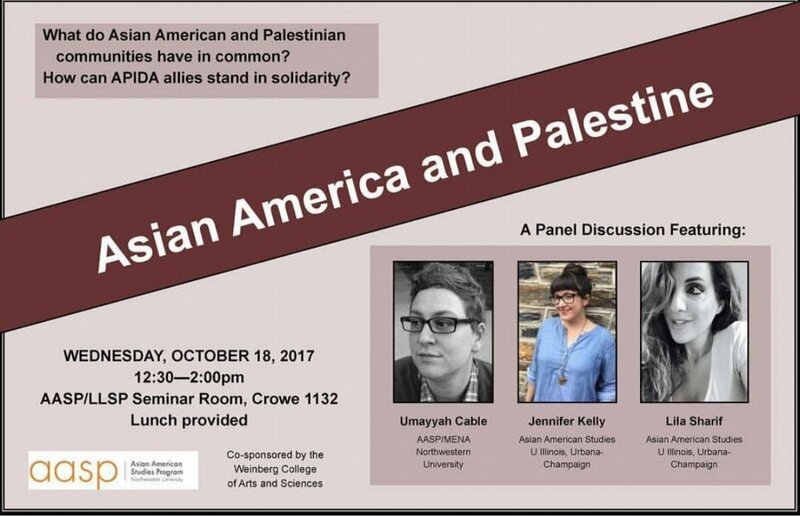 She is currently completing the manuscript for her first book, Invited to Witness: Solidarity Tourism Across Occupied Palestine, a multi-sited ethnographic study of solidarity tourism in Palestine that draws from research she completed as a 2012-2013 Palestinian American Research Center Fellow. In her project, she analyzes the ways in which solidarity tourism has emerged in Palestine as an organizing strategy that is both embedded in and working against histories of sustained displacement. “Asymmetrical Itineraries: Militarism, Tourism, and Solidarity in Occupied Palestine,” American Quarterly, Special Issue: Tours of Duty/Tours of Leisure, eds. Vernadette Vicuña Gonzalez, Jana K. Lipman, and Teresia Teaiwa, Volume 68, Issue 3 (September 2016): 723-745. 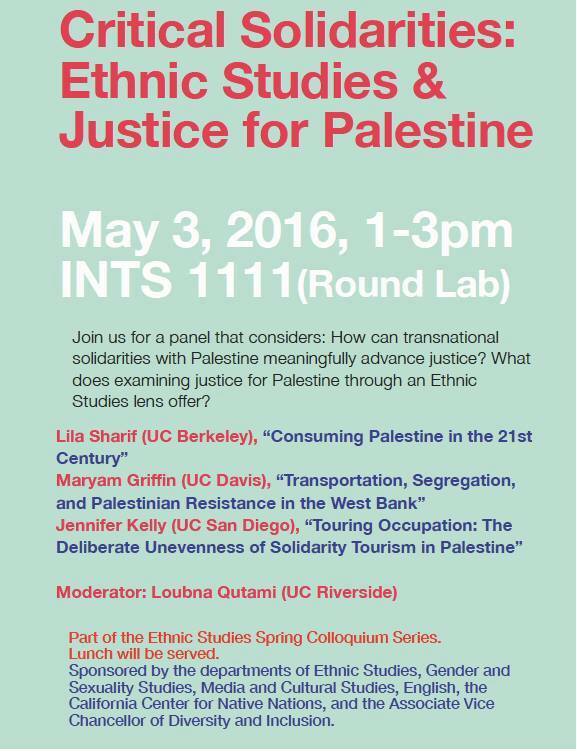 “Locating Palestine within American Studies: Transitory Field Sites and Borrowed Methods,” Theorizing Fieldwork in the Humanities: Methods, Reflections, and Approaches to the Global South, eds. Shalini Puri and Debra Castillo (New York: Palgrave Macmillan, 2016): 97-110. "Technologies of Empire and the Rejection of Warfare’s Refrains: A Review of Caren Kaplan’s Aerial Aftermaths, Jennifer Terry’s Attachments to War, Inderpal Grewal’s Saving the Security State, and Lisa Parks and Caren Kaplan’s edited volume Life in the Age of Drone Warfare," Radical History Review, Issue 133 (January 2019): 163-176. "Palestine at the Center:" A Review of Pamela Pennock's The Rise of the Arab American Left: Activism, Allies, and their Fight Against Imperialism and Racism, 1960s–1980s (Chapel Hill: University of North Carolina Press, 2017). Middle East Report, Volume 283, Issue 47: America First 2.0 (Summer 2017): 47-48. “One of the Guys: A Feminist Analysis?” A Review of One of the Guys: Women as Aggressors and Torturers, ed. Tara McKelvey (New York: Seal Press, 2007). Anamesa: An Interdisciplinary Journal, Volume 6, Issue 1 (Spring 2008): 114-130 [Peer-reviewed New York University Journal]. My book manuscript, Invited to Witness: Solidarity Tourism Across Occupied Palestine, is a multi-sited ethnographic study of solidarity tourism in Palestine. 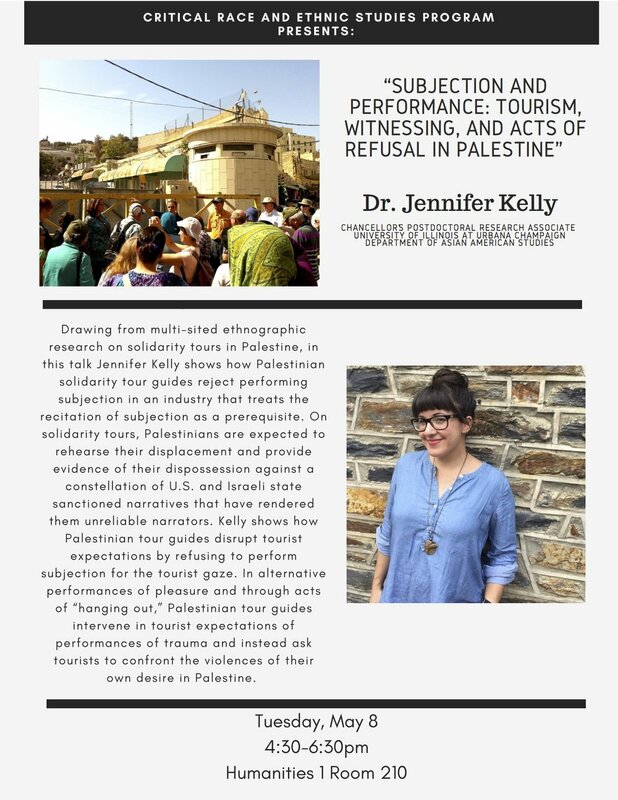 Situating Palestine as a central site of inquiry for feminist studies, critical ethnic studies, and transnational American studies, I analyze the relationships between race, colonialism, and movement-building in spaces where tourism and military occupation function in tandem. I use the term solidarity tourism to refer to forms of travel that are animated by a desire on the part of tour guides to cultivate solidarity with their cause and tourists’ desire to establish a deeper connection to a particular social movement. Drawing from participant observation of solidarity tours across Palestine/Israel and interviews with guides, organizers, community members, and tourists, I explore what happens when tourism understands itself as solidarity and when solidarity functions through modalities of tourism. I argue that solidarity tourism in Palestine functions as a fraught localized political strategy, and an emergent industry, through which Palestinian organizers refashion conventional tourism to the region by extending deliberately truncated invitations to tourists to come to Palestine and witness the effects of Israeli state practice on Palestinian land and lives. I describe the invitation as a genre, marked by the repetition of certain conventions, and I theorize who the invitation is for, what it is meant to do, and how those subjects we understand as “toured” redefine the invitation in order to confront and resist settler-colonial contexts that are nowhere near “settled.” I also detail the conditions that have led Palestinians to make their case through solidarity tourism in the first place, describing the ways in which tourists travel to Palestine to see the effects of Israeli occupation for themselves despite the volumes of literature Palestinians have produced on their own condition. this way, Invited to Witness shows how Palestinian organizers, under the constraints of military occupation, and in a context in which they do not control their borders or the historical narrative, wrest both the capacity to invite and, in Edward Said’s words, “the permission to narrate” from Israeli control. 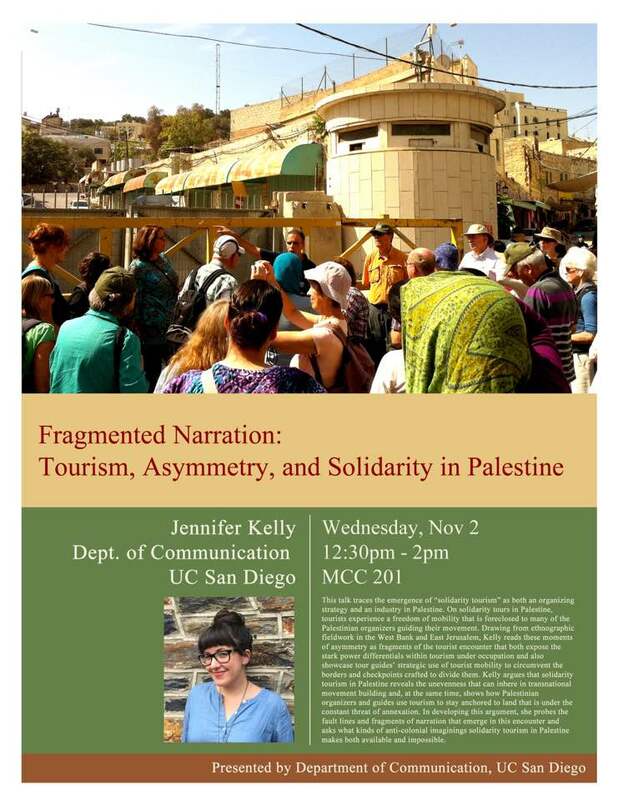 Invited Talk, “Fragmented Narration: Tourism, Asymmetry, and Solidarity in Palestine,” Tourism Studies Working Group Colloquium, University of California, Berkeley, April 2017. Invited Panelist, “Tourism under Occupation: Post-Oslo Fragmentation and the Labor of Narration,” New Directions in Palestinian Studies Symposium: Political Cultures and the Cultures of Politics, Middle East Studies Program and the Watson Institute for International Studies, Brown University, Providence, Rhode Island, March 2015. “Itineraries through Occupied Spaces: Routinized Violence, Solidarity Tourism, and the Fraught Politics of Witnessing,” Panel: Spaces Under Construction: Building Towards an Anthropology of Contemporary Settler Colonialism in Palestine-Israel, panel co-sponsored by the Middle East Section and the Society for Urban, National and Transnational/Global Anthropology, American Anthropological Association Annual Meeting, Washington, D.C., December 2014. “Pinkwashing, Tourism, and Anti-Colonial Resistance,” Panel: The Psychology of Pinkwashing, The Homonationalism and Pinkwashing Conference, City University of New York Graduate Center and the Center for Lesbian and Gay Studies, New York City, April 10-11, 2013. 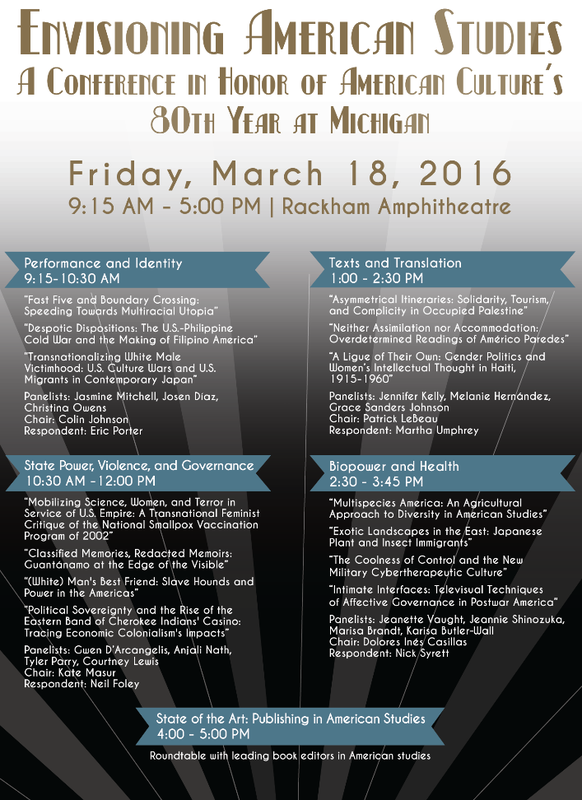 For more information about the conference, see the conference website: http://www.homonationalism.org. For more information about CLAGS, see: http://www.clags.org.